Welcome to Shaggy God, your home for the bear enthusiast and scholarly discussion on everything bears. This forum is still under construction. 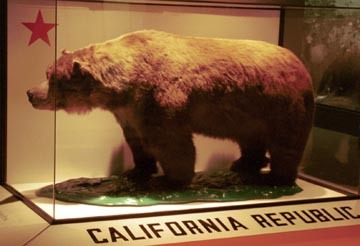 The California grizzly bear was designated the official State Animal in 1953. Before dying out in California, this largest and most powerful of carnivores thrived in the great valleys and low mountains of the state. As California began to populate, the grizzly stood its ground, refusing to retreat in the face of advancing civilization. It killed livestock and interfered with settlers. Less than 75 years after the discovery of gold, every grizzly bear in California had been tracked down and killed. The last one was killed in Tulare County in August 1922. More than 20 years later, the authority to regulate the taking of fish and wildlife was delegated to the California Fish and Game Commission by the State Legislature. 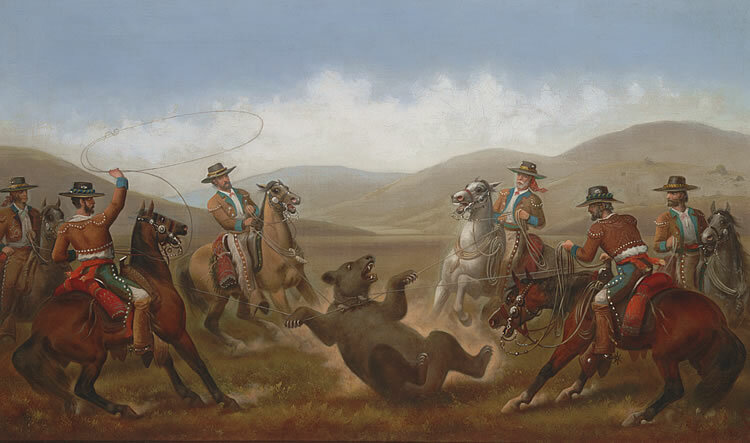 Figure 3: California grizzly bear (Anonymous painting, 1856). Grizzly bears were once abundant throughout California where they had managed to co-exist with Native Americans for thousands of years. Like bears today in Alaska, they presumably fed heavily on the abundant salmon in the rivers as well as on a wide variety of other foods, with individuals roaming widely. European American settlers, however, regarded them as competitors and as predators on livestock, and so hunted them into extinction. The last grizzly bear in California was killed in 1922. 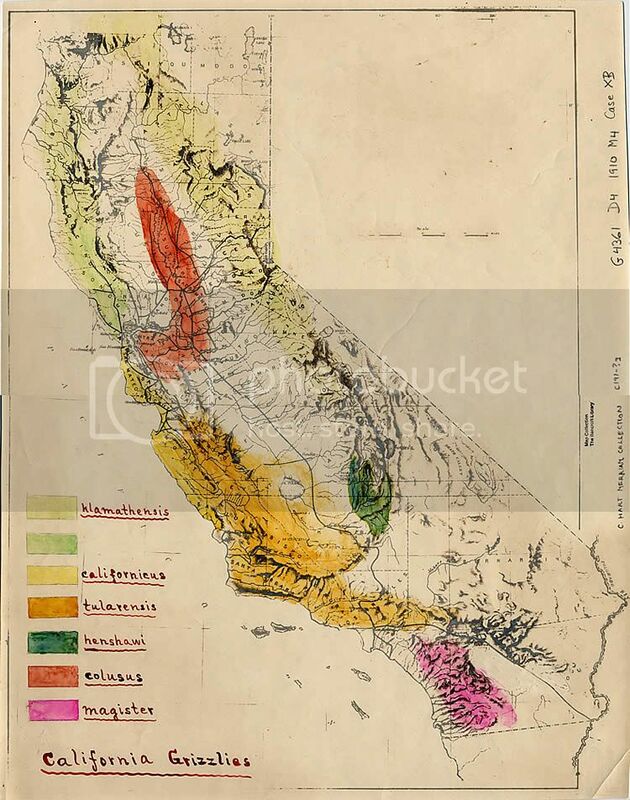 C. Hart Merriam's hand-colored map shows the distribution of the seven subspecies of the California Grizzly he identified and described. URSUS CALIFORNICUS Merriam. California Coast Grizzly. [Ursus horriaus] subspecies californicus Merriam, Proc. Biol. Soc. Washington, X, pp. 76-77, April 13, 1896. Vrsus californicus Merriam, Proc. Biol. Soc. Washington, XXVII, pp. 186, 188, August 18, 1914. Type specimen.—Skull No. 3630, (male) old, U. S. National Museum. Range.—Humid coast region of California from San Francisco Bay south about to San Luis Obispo (apparently passing into tularensis in the dryer interior). Characters.—Size large; claws long and smooth; pelage variable. Dentition heavy; last upper molar large, its heel long and broad. Cranial characters.—Adult male: Skull long and narrow; vault of cranium flat—not arched; frontal shield flat (or concave medially), short pointed posteriorly, gradually sloping almost in same plane with rostrum (dishing slight); temporal impressions beaded; postorbitals massive and moderately spreading; zygomata slightly bowed; rostrum long, slightly compressed in front of orbits; nasals nearly horizontal, slightly rising posteriorly in plane of shield; frontal shield moderately broad, slightly swollen over orbits, the point lost in sagittal crest 25 to 50 mm. anterior to fronto-parietal suture; postorbital processes strongly developed, subtriangular, rather massive, outstanding, and slightly decurved over orbits; sagittal crest strongly developed and nearly straight; squamosal shelf broad; squamosal base of zygoma vertically expanded in aged skulls; frontal part of braincase in young-adult skulls somewhat elevated and tending to " keel" into crest; mastoid processes long; interpterygoid fossa long and usually narrow; underjaw long and massive, ramus broad vertically. Teeth large and heavy; M-2- subrectangular, heel long, broad posteriorly. Skull of female: Similar to that of male, but smaller. Cranial comparisons.—Adult and old male compared with adult male klamathensis (type): Skull longer; zygomatic breadth essentially the same; face and rostrum longer; rostrum more compressed in front of orbits; fronto-nasal region more dished; frontal shield more concave medially and more swollen at orbital rims; postorbital processes much more massive, slightly arched, the tips slightly de-curved; temporal beads more strongly incurved; sagittal crest shorter posteriorly; lambdoid crest more outstanding laterally; occipital overhang much less; squamosal shelf behind zygoma much shorter; occipito-sphenoid and palate longer; mastoids much longer and more strongly outstanding. Underj aw much longer. Dentition heavier, the last upper and middle lower molar in particular much larger; heel of M2- very broad and broadly rounded posteriorly. Old male from Monterey, compared with old male colusus (type, from Sacramento Eiver): Fronto-nasal region slightly higher and less depressed; rostrum higher, less depressed, and less horizontal; postorbitals much larger and more swollen; orbital rims more swollen; orbits more nearly vertical, squamosal base of zygoma more expanded; palate narrower anteriorly; ramus much broader vertically, its inferior border less convex in middle part and more bellied posteriorly; apex of coronoid more produced posteriorly; angular process larger and longer; mastoids longer and directed less anteriorly, not reaching so near glenoid process. Dentition stronger and strikingly din3erent: canines larger; upper incisors and both upper and lower molars very much larger; heel of large and not normally emarginate. Skull measurements.—Old male (type): Basal length, 361; oc-cipito-nasal length, 346; palatal length, 196; zygomatic breadth, 224; interorbital breadth, 82. Ursus californicus tularensis Merriam, Proc. Biol. Soe. Washington, XXVII, p. 188, August 13, 1914. Type locality.—Fort Tejon, Canada de las Uvas, Tehachapi Mountains, California. Type specimen.—No. 3536, (male) old, U. S. National Museum. Collected by John Xantus. Range.—Dry chaparral hills of interior coast ranges between the San Joaquin Valley and Los Angeles plain, comprising the Tehachapi, Tejon, Sierra Madre, and San Gabriel Eanges, and probably San Bernardino Mountains also, and ranging northward an unknown distance, doubtless covering the San Kafael and Gabilan Eanges, and southern part of the Diablo Eange; limits unknown. male, rather straight (tips worn off), straighter and broader than in female magister. Color.--Nearly full-grown male killed by Walter Eichardson, near head of Tejunga Canyon, San Gabriel Mountains, Southern California, in 1897: General color very dark brown, almost dusky; grizzled on upperparts by admixture of pale-tipped hairs; muzzle reddish brown. Cranial characters.—Old mole: Skull large, rather broad and flat frontally, moderately dished, moderately high, with large outstanding postorbitals and beaded temporal ridges. Frontal shield rather broad, swollen, and somewhat elevated on orbital rims and base of postorbitals, depressed intcrorbitally, sloping gradually into rostrum; rostrum large and rather high; fronto-nasal region not depressed; sagittal crest rather short, elevated and produced posteriorly; occipital overhang marked; zygomata moderately spreading, subtriangular; palate and postpalatal shelf broad and flat, mastoids rather long and inclined strongly forward. Underj aw large and rather massive; ramus broad vertically, strongly bellied posteriorly; coronoid rather high, its apex not strongly recurved. Teeth large; M-2 sub-rectangular, the long heel only slightly emarginate on outer side. Adult and old females: Skulls more easily distinguished than in males from their nearest relative, californicus. The skull of the female is much more like the normal female grizzly type, not resembling the males as does the female of californicus. Cranial comparisons.—Adult and old females compared with female californicus: Skull decidedly smaller; frontal shield behind plane of postorbital processes more elevated and convex—not depressed and concave as in californicus; point of shield longer and broader; orbital rims more swollen; sagittal crest shorter and lower; palate at least 10 mm. shorter; occipito-sphenoid about 10 mm. shorter; underjaw smaller and lighter; last upper molar decidedly smaller. Normal M-2- subrectangular as in californicus (in henshawi sub triangular and small). Adult and old males compared with male californicus: Similar but smaller; base of cranium shorter; palate slightly shorter; occipito-nasal length decidedly less; braincase decidedly shorter; zygomatic breadth same or slightly greater—the skull as a whole relatively broader than in californicus; postpalatal shelf broader; underjaw materially shorter; M1 decidedly smaller (both shorter and narrower) ; lower series of teeth smaller, M1 and M2 particularly smaller, much narrower and less massive; heel of last upper molar less broad than in californicus. Adult male compared with henshawi (type): Skull larger and more massive; fronto-nasal region much higher and much less dished; rostrum larger, higher, and not depressed; zygomata more 64854°—18-3 broadly spreading: postpalatal shelf broader; coronoid larger and less falcate; ramus broader vertically; last upper molar much larger, the heel long and broad posteriorly, contrasted with the short sub-triangular heel of henshawi. 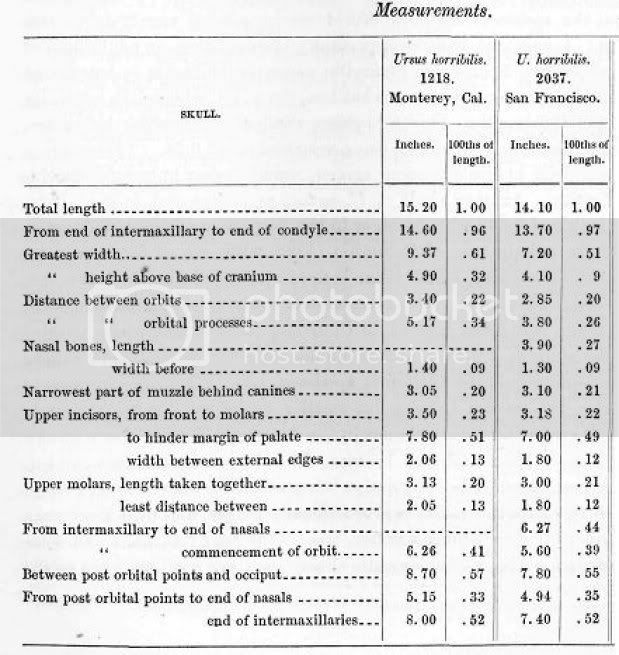 Skull measurements.—Average of two old males from Fort Tejon, California: Basal length, 329; occipito-nasal length, 320.5; palatal length, 179.5; zygomatic breadth, 228; interorbital breadth, 78. Old female from Fort Tejon: Basal length, 296; occipito-nasal length, 287; palatal length, 162; zygomatic breadth, 187; interorbital breadth, 75. In 1889, Allan Kelly, a reporter for the San Francisco Examiner, was summoned to the office of William Randolph Hearst where he was asked the question "Do you think you could get me a California grizzly bear?" Kelly replied, "I think I could get a bear if I tried. Do you what him dead or alive?" The reply: "Alive." Kelly left immediately for Southern California and went to the Ojai Valley in Ventura County near Santa Paula. He secured the services of a guide, three other men, a pack mule, and suitable horses. For six months the five men camped in the mountains, setting traps and cages built of logs, and baited with quarters of beef. Finally their efforts were rewarded and one of the traps held a huge grizzly. They waited two days for the bear to calm down and then fashioned a noose from chain and put it through the logs. 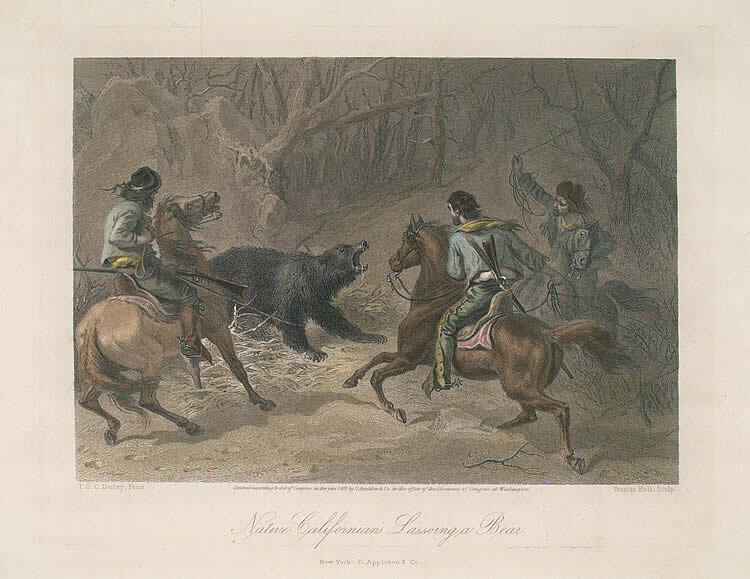 When the bear stepped into the noose, four men hauled away but with one whip of his paw, the bear jerked the chain from the men and snarled. Next another noose was fashioned and dropped through the top of the cage. When the bear stepped in it, the chain was jerked up to his shoulder and after several hours of struggle, it was secured to the cage. Then the other legs were snared and finally the bear was spread eagled on the ground. Finally he was offered a stick which he grabbed in his jaws and a rope was passed several times around the stick and jaws. Fashioning a skid, it took fours days to pull the bear down to a road. 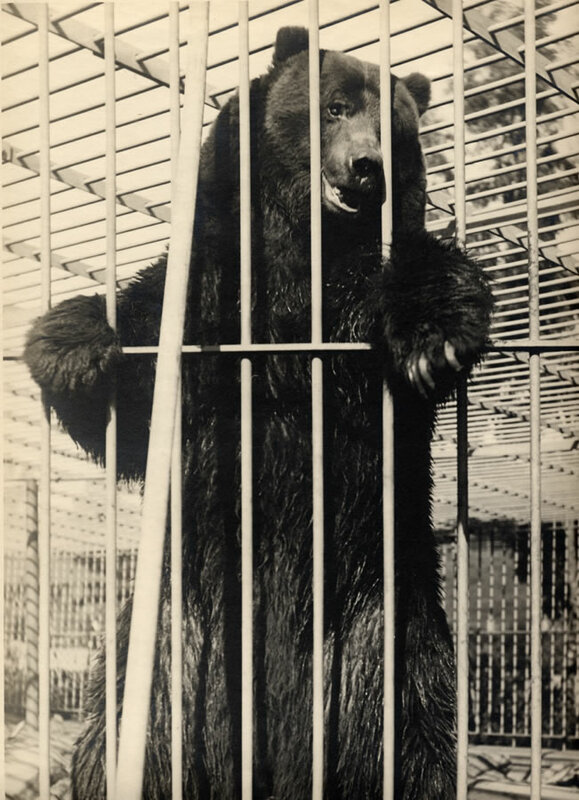 There another cage was constructed and the now caged bear was placed on a wagon and transported to the railway in Ventura where he was placed in a box car and shipped to San Francisco. A jubilant Hearst called the park and said " I have a grizzly bear for your Menagerie." Park staff replied "We don’t want him" so Monarch, as the bear was named, was taken to Woodward’s Gardens to be placed on display. When the Midwinter Fair came to San Francisco in 1894, Monarch was at last brought to Golden Gate Park and lowered into a huge concrete pit prepared for him. After the Fair, an iron cage was built for Monarch at the top of the hill between what is now the Aids Grove and handball courts. The bars were bent in at the top to keep the bear from climbing out and Monarch seem satisfied with the situation until someone donated an Alaskan moose to the Park. Monarch immediately developed a fondness for moose meat and attendants had to use iron bars to keep him from climbing out. He was placed in a smaller cage until the cage could be reinforced. After a few years, Monarch showed signs of loneliness and it was feared he might die. Again Hearst stepped in and purchased a female silver tip grizzly from Idaho. When the female arrived in 1903, Monarch immediately showed his interest. The female was placed in an adjoining cage and Monarch plowed the ground until he’d dug a trench big enough for two bears his size but without attracting any attention from the female, he proceeded to lie down in the hole and gaze longingly though the bars. The female was in new mood for his antics and even vented her displeasure on a photographer who was trying to conduct an interview. The next day, the two bears were put in the same cage and they romped and played together for over an hour, but finally the female decided Monarch was getting too familiar and she reared up on her hind legs and boxed his ears. Animal courtship being what it is, Monarch finally established a relationship and his descendents can be found at the zoo. Upon his death in 1911, he was stuffed and stands now in the California Academy of Science not far from where he was caged. 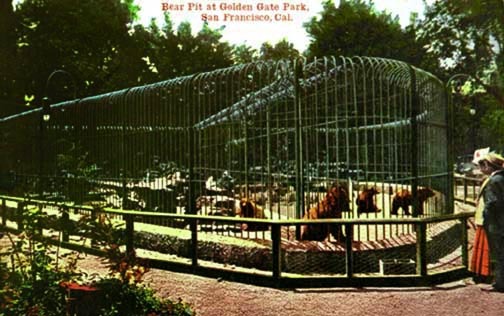 The Bear Cage remained in the park until the late 20’s when an adventurous boy climbed the fence and was attacked by a bear and blinded. The city paid $6,000 to the child and today the bear cage is just a memory. Monarch was named for the San Francisco Examiner, "The Monarch of the Dailies." His stuffed remains served as model for the bear on our state flag. Ursus colusus Merriam, Proc. Biol. Soc. Washington, XXVII, pp. 187-188, August 13, 1914. Type locality.—Sacramento River valley, California (probably between Colusa and Sacramento). Type specimen.—No. 3837, (male) old, U. S. National Museum. Collected by the Wilkes TJ. S. Exploring Expedition and marked " C. P. Ex. Ex. 6.16 " (the numerals uncertain, there being indication of a figure in front of the first 6). The words "Grizzly Bear, Sacramento " are written on the right parietal in pencil. Range.—Sacramento (and perhaps also San Joaquin) Valley and adjacent foothills; westerly in the hot inner coast mountains to Dobbins Creek canyon on the boundary between southeastern Humboldt and southwestern Trinity Counties. Characters.—Size large, external characters unknown. Skull large and long, resembling that of californicus, but teeth smaller and last upper molar very different. Cranial characters.—Old male: Skull large, long, and low, the frontal shield flat, postorbital processes moderate or small, fronto-nasal region moderately dished, palate long, sagittal crest high, temporal ridges beaded, and occipital overhang pronounced. In general resembling largest skulls of californicus but having very much smaller teeth and differing in numerous minor cranial characters. Young-adult female: One from San Jose Mission (No. 1143, Yale Museum) appears to be a not quite grown female colusus. The last upper molar is short and subtriangular, the heel emarginate on outer side. Cranial comparisons.—Old male (type) compared with old male californicus (from Monterey): Fronto-nasal region slightly lower and more depressed; rostrum lower, more depressed and more nearly horizontal ; postorbitals much smaller and less swollen; orbital rims less swollen; orbits less nearly vertical; squamosal base of zygoma less ex-panded; palate broader anteriorly; ramus much less broad vertically, its inferior border more convex in middle part and less bellied posteriorly ; apex of coronoid less produced posteriorly; angular process smaller and shorter; mastoids shorter and directed more anteriorly, reaching nearer to glenoid process. Dentition weaker and strikingly different: canines too badly broken to admit of satisfactory comparison, but obviously smaller; upper incisors and both upper and lower molars very much smaller; heel of M2 small and strongly emarginate on outer side, of same size and approximately same form as in kla-mathensis but even more strongly constricted on outer side immediately behind second cusp; lower molars of same size as in klamathen-sis though the jaw is much longer. Old male (type) compared with Mamathensis: Postorbitals, length of sagittal crest, form of zygomata, and dentition essentially the same, but skull longer; vault of cranium much lower; frontal shield narrower and much shorter; temporal beads much more strongly incurved; fronto-nasal region dished instead of elevated; rostrum much lower, more depressed, and more nearly horizontal; ramus longer, less broad vertically; diastema much longer. Skull measurements.—Old male (type) : Basal length, 352; occipito-nasal length, 337; palatal length. 185; zygomatic breadth, 228; interorbital breadth, 82.5. 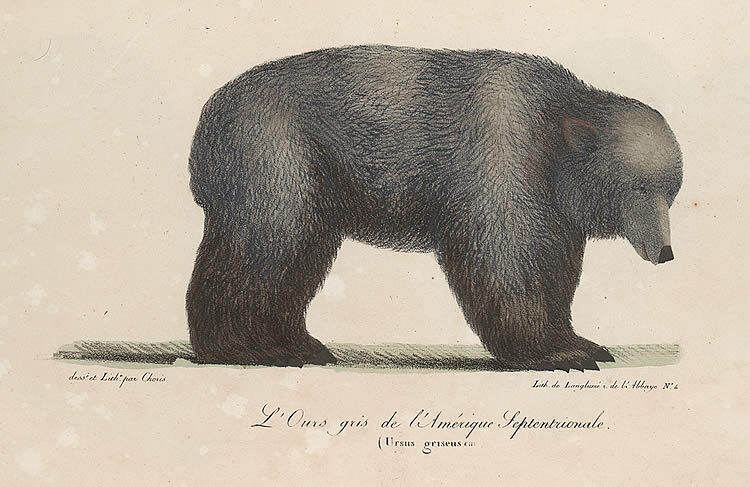 Ursus mendocinensis Merriam, Proc. Biol. Soc. Washington, XXIX, pp. 145-146, September 6, 1916. Type locality.--Long Valley, Mendocino County, California. Type specimen.—No. 206625, $ old, U. S. National Museum, Biological Survey collection. Obtained through Charles J. and Frank H. Hittell. Characters.—Size rather large, about equaling kclamathensis but apparently smaller than californicus and colusus; external characters unknown. Affinities with klamathensis, with which it may inter-grade at the north. Cranial characters.—Skull short, broad, highly arched, and strongly dished, with widely outstanding zygomata and truncate occiput. Frontal shield of moderate breadth, short pointed posteriorly, slightly convex between orbits, strongly sloping to rostrum; rostrum short, broad, and strongly depressed; postorbital processes moderate, sub-peglike, horizontally outstanding; sagittal crest high, thick, humped anteriorly, short posteriorly; occiput obliquely truncate; occipital overhang slight compared with that of californicus and colusus; palate short and rather broad; postpalatal shelf of moderate breadth, flat; postpalatal notch moderate; mastoids rather short, directed anteriorly. Underjaw absent. Teeth gone except left hind molar, which is short, with small heel, obliquely truncate on outer side (as in klamathensis). Cranial comparisons.—Similar in general to klamathensis but fronto-nasal region strongly dished, rostrum shorter, broader, flatter on top, and depressed instead of elevated; zygomata more widely outstanding; palate broader; occipital overhang less. Skull measurements—Old male (type) : Basal length, 327; occi-pito-nasal length, 323; palatal length. 183; interorbital breadth, 84.5. Ursus magister Merriam, Proc. Biol. Soc. Washington, XXVII, p. 189, August 13, 1914. Type locality.—Los Biacitos, head of San Onofre Canyon, Santa Ana Mountains, Southern California. Type specimen.—No. 160155, (male) old, U. S. National Museum, Biological Survey collection. Killed in August, 1900 or 1901, by Henry A. Stewart and by him presented to the Biological Survey. Range.—Santa Ana or Trabuco Mountains, Cuyamaca and Santa Rosa Mountains, and probably San Jacinto Mountains. Believed to be extinct. 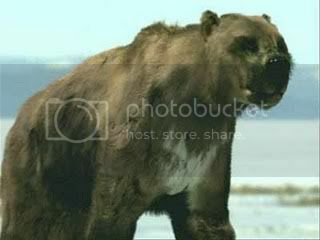 Characters—-Size of male huge (estimated weight over 1,400 pounds), largest of known grizzlies, considerably larger than californicus of the Monterey region, and even than horribilis, the1 great buffalo-killing grizzly of the Plains (only equaled by the largest alexandrai of Kenai Peninsula); sexual disparity great; skull of female hardly half the bulk of male; skull of male of a rather generalized type; not dished. Claws of old female from head of Trabuco Canyon, Santa Ana Mountains, exceedingly long, strongly curved, mainly yellowish above. Color.— (Old female from head of Trabuco Canyon): General color dusky or sooty all over except head and grizzling of back. Muzzle gray or mouse brown, palest above; top of head and neck very dark brown, sparsely grizzled with pale-tipped hairs; back dusky grizzled with grayish; legs and underparts wholly blackish. Cranial characters.—Adult male (type) : Skull exceedingly large, long; vault of cranium arched, but not abruptly; rostrum long and high; fronto-nasal region elevated, in same plane with frontal shield and rostrum; frontal shield flattish-convex, faintly sulcate medially and slightly swollen on each side between postorbital processes, the point decurved and reaching fronto-parietal suture; zygomata only moderately spreading, angular, the posterior root expanded and rising abruptly from plane of squamosal shelf; sagittal crest rather short; palate scooped out anteriorly, forming a basinlike depression surrounding the anterior palatine foramina; occipito-sphenoid length 103.5 mm. Underjaw long; ramus broad and flat vertically, its inferior border moderately bellied and incurved posteriorly; coronoid blade large, its apex strongly recurved, cutting plane of middle of condyle. Teeth large and broad but by no means disproportionate to large size of skull; M1 broad; last upper molar absent, but from its alveolus and its form in female, obviously broad, short, strongly triangular, the heel small, narrowed posteriorly, obliquely emarginate on outer side; PM4 broad, with rather short slightly sloping heel, narrow imperfect sulcus without posterior cusplets; M4 apparently normal (much worn in type specimen); middle lower molar absent in type specimen but apparently normal (judging from the female, in which, however, it is badly worn). Female of extreme age (No. 156594, from Trabuco Canyon, killed January 5, 1908, by Andrew Joplin and Edward Adkinson) : Size small; rostrum short and depressed; fronto-nasal region strongly dished; frontal shield flattish, slightly sulcate interorbitally, short pointed, beaded posteriorly by elevated temporal impressions, rising rather abruptly at orbits; sagittal crest long and nearly horizontal; palate and postpalatal shelf broad, flat posteriorly, concave anteriorly. Cranial comparisons.—Ursus magister does not require close comparison with any other species. 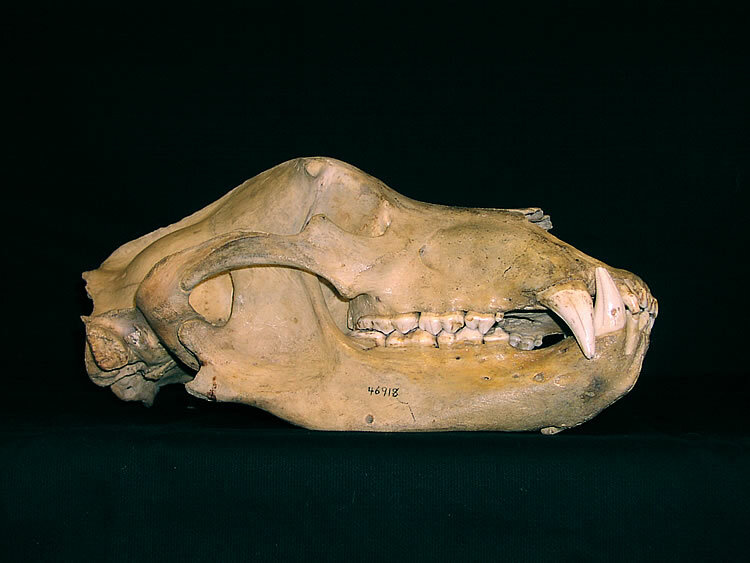 "While the largest skulls of old male californicus equal it in basal length, they are so much lower, narrower, and smaller in every way that detailed comparisons are unnecessary. The species which it most nearly resembles is oairdi from the mountains of Colorado, but the resemblance is not close. It differs from oairdi in somewhat larger size, much more highly arched vault of cranium, much broader and more strongly sloping frontal shield, more posterior mastoids, longer underjaw with much more broadly flattened and less massive ramus, and in important tooth characters. Between the two geographically is utahensis, which, like magister, has the ramus of the underjaw very broadly flattened vertically, but in form of cranium utahensis goes to the opposite extreme, the frontal shield, rostrum, and braincase being exceptionally narrow, and the fronto-nasal region compressed and elevated. Flesh measurements.—Old male (type) : Height at shoulder from flat of foot 4 ft. (=1,220 mm. ); total length, snout to tail, 9£ ft.1 (=2,900 mm. ); sole of largest foot without claws: length 12 in. (=305 mm. ); breadth 8 in. (=204 mm.). Length of old female from Trabuco Canyon, measured in the flesh by Andrew Joplin, 6 ft. 3 in. Skull measurements.—Old male (type): Basal length, 365; occipito-nasal length, 366; palatal length, 197; zygomatic breadth, 236; interorbital breadth, 97. Ursus Klamathensis Merriam, Proc. Biol. Soc. Washington, XXVII, pp 185-186, August 13, 1914. Type locality— Beswick, near mouth of Shovel Creek, Klamath Eiver, northern California. Type specimen.—No. 178735, (male) ad., U. S. National Museum, Biological Survey collection. Collected and presented by Charles Far-well Edson. Characters.—Size of male large; skull in general of the idahoensis type, but larger and with heavier canines. Claws moderate, rather strongly curved, horn color, washed with yellowish basally and "with pale yellowish markings at tips, marked longitudinally with fine parallel striae. Skin characters unknown. Cranial characters—Skull large and high, highest about 40 mm. in front of fronto-parietal suture; rostrum long, high, and ascending in plane of frontal shield; fronto-nasal region elevated, scarcely if at all dished; frontal shield broad, flat, sloping, and rather short pointed; postorbital processes moderate, peglike, horizontally outstanding; sagittal crest long and well developed; lachrymal duct opening on orbital rim (rather posteriorly than anteriorly); zygomata moderately spreading, only moderately expanded vertically; anterior (frontal) part of braincase keeling into sagittal crest; occiput produced posteriorly (overhang much greater than in californicus); squamosal shelves long and broad; palate rather flat, slightly arched lengthwise; postpalatal shelf broad and flat; occipito-sphenoid short for so large a skull (length 89 mm. ); basioccipital very broad anteriorly; mastoids vertical and short. "Underjaw long; ramus exceptionally broad and flat vertically; coronoid blade large and high, broad basally. Canines very large; molars moderate; last upper molar relatively small, the heel emarginate or obliquely truncate on outer side; middle lower molar with anterior moiety much larger than posterior. Large upper premolar absent and no trace of alveolus. Cranial comparisons.—Curiously enough hlamathensis does not require close comparison with any of the other species inhabiting California, its only near relatives being members of the shoshone-idahoensis group of the Rocky Mountains, and pervagor of interior British Columbia. Adult male (type) compared with old male idahoensis (No. 187888, = No. 93, Merriam collection, from North Fork Teton River, eastern Idaho) : Similar in general form and proportions but larger (condylobasilar length 350 mm. contrasted with 335); vault of cranium somewhat higher; frontal shield broader and flatter; palatal length about the same; postpalatal length much greater (150 contrasted with 135); opening of lachrymal duct slightly more posterior; occipital overhang greater; basioccipital anteriorly very much broader; ramus of underjaw longer and much broader vertically; coronoid blade higher. Canines larger and longer; last upper molar shorter. Adult male (type) compared with adult male pervagor (type): Similar in size and general characters; vault of cranium slightly higher; frontal shield flatter and somewhat broader; postorbitals not quite so large; fronto-nasal region more elevated (in pervagor slightly dished); rostrum broader anteriorly; occipital overhang greater; ramus of underjaw'much more broadly expanded vertically and natter; canines and molars very much larger. Adult male (type) compared with old male henshawi (type): Ursus hlamathensis and U. henshawi belong to widely different groups and do not require detailed comparison. U. hlamathens-is may be distinguished at a glance by its much larger size, much higher vault of cranium, highly elevated and continuously sloping fronto-nasal region and rostrum, and peglike postorbitals—in striking contrast to the much smaller, lower, and strongly dished skull of henshawi, with its low depressed rostrum and large broadly rounded postorbitals. Adult male (type) compared with adult male californicus (from coast region south of San Francisco Bay): The differences are marked in the skull and striking in the teeth. In Iclamathensis the vault of the cranium is lower posteriorly and higher anteriorly; the frontal shield natter laterally; the rostrum shorter; the base of the cranium (occipito-sphenoid) decidedly shorter. The last upper and middle lower molars are widely different, the heel of M2 in californicus large, long, and broad posteriorly, while in Iclamathensis it is small and emarginate on outer side; the anterior part of MY in californicus is normal, while in hlamathensis it is disproportionately large. Skull measurements.—Adult male (type): Basal length, 331; occipito-nasal length, 337; palatal length, 175; zygomatic breadth, 223; interorbital breadth, 85.5. Ursus henshawi Merriam, Proc. Biol. Soc. Washington, XXVII, p. 190, August 13, 1914. Type locality.—Southern Sierra Nevada, near Havilah, Kern County, California. Type specimen.—No. 15671, (male) old, U. S. National Museum. Collected in 1875 by Dr. J. T. Rothrock and Henry W. Henshaw. Range.—Lower slopes of southern part of Sierra Nevada; limits unknown. Characters.—Size rather small—by far the smallest of the California grizzlies; size and general cranial characters as in horriceus, but fronto-nasal region strongly dished and rostrum strongly depressed. Last upper molar short and broad, the heel short and subtriangular. Skin characters unknown. Cranial characters.—Old male (type) : Skull long, narrow, and rather low; zygomata subtriangular, narrowly spreading; frontal shield gently sloping, flat-concave; postorbital processes massive, and somewhat arched; orbital rims swollen; fronto-nasal region strongly depressed and dished; rostrum low, depressed. Cranial comparisons.—Compared with an equally old male horriceus (type, from Coppermines, New Mexico): Surprisingly similar in general, with similar broad outstanding postorbitals, but rostrum strongly depressed; nasals flattened and horizontal anteriorly; frontonasal region concave and strongly dished (in horriceus rather high and not dished); frontal shield strongly and broadly concave between, orbits and between postorbital processes (only faintly depressed medially in horrimus); more strongly sloping anteriorly; postorbital processes shorter and blunter; orbital rims more prominent, relatively thin, somewhat everted, continuing to lachrymal notch—their prominence anteriorly due in part to presence of a broad sulcus in ascending arm of maxillary immediately in front of orbit; lachrymal duct opening in orbit posterior to orbital rim (in horriceus on or anterior to rim); anterior nares broader than high (contrary true in horriceus); lambdoid crest higher; sagittal crest and inion much shorter; occipital overhang much less; palate decidedly broader; interpterygoid canal shorter; mastoid processes much longer and more divergent; anterior part of pterygoids more broadly expanded vertically and articulating with a like expansion of posterior arms of palatines (probably not constant). Upper molars decidedly broader (canines broken off). Compared with two old males of tularensis (type, No. 3536, and No. 3537, from Fort Tejon, California): Size smaller; occipito-sphenoid length and frontal breadth essentially the same; vault of cranium and rostrum very much lower; fronto-nasal region more deeply concave, more strongly sloping, and strikingly more dished; rostrum smaller, lower, and strongly depressed instead of elevated; occipital overhang and development of inion conspicuously less; posterior part of sagittal crest not elevated or produced. Underjaw decidedly shorter, ramus much less broadly flattened vertically and more strongly bellied posteriorly. Last upper molar much smaller, the heel conspicuously shorter and narrowed on outer side. Skull measurements.—-Old male (type) : Basal length, 318; oc-cipito-nasal length, 305; palatal length, 173; zygomatic breadth, 204; interorbital breadth, 76. I have this book (very nice read). Yeah, I think this book is very nice, too. 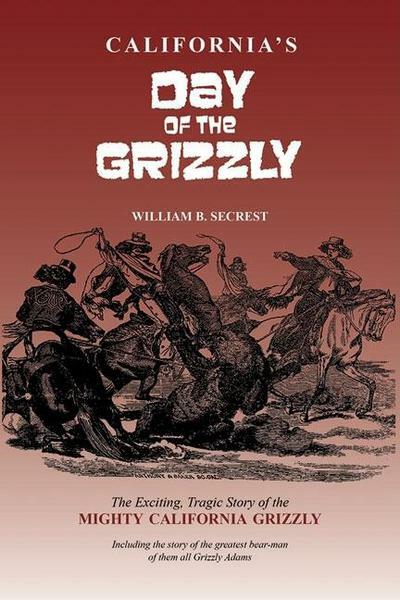 I liked this book on California Grizzlies just as much maybe more. The 2007 book is a reprint, the original publication was 1930. Spencer Fullerton Baird in The Mammals of North America, 1859.